As tattoos have become more common in mainstream society, so too does “tattoo regret.” The tattoo may be poorly rendered or have lost its definition over time. A tattoo may no longer be age or work appropriate. Whatever the reason for removal, it’s good to know what the best and most cost-effective methods of tattoo removal are. Tattoo removal creams are fast emerging as one of the least painful and inexpensive methods of tattoo removal. However, do they work? Are tattoo removal creams really effective? What is the best tattoo removal cream? Tattoo removal creams are applied to tattooed skin in order to erase the ink over time. 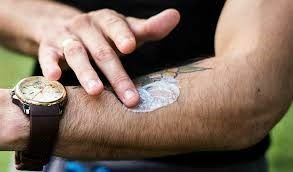 They’re topical ointments that are meant to gradually fade or eliminate tattoos after repeated application. Compared to other tattoo removal methods like laser tattoo removal, they’re painless, inexpensive, and convenient to purchase. Many of the best tattoo removal creams can be found in the local pharmacy. If they’re not available at a regular pharmacy, they most certainly are online. Does tattoo removal cream actually work? There is a lot of controversy around whether tattoo removal creams really are effective. It’s important to note that there are broadly two kinds of tattoo removal creams: those that essentially bleach the skin, and those that peel a layer of skin. The first kind of cream is hydroquinone based, which is an aromatic organic compound. When applied to the skin, the cream acts as a lightening agent. As the skin’s pigmentation is lightened, the tattooed area will gradually lighten and fade as well. The second type of cream is a bit more aggressive in its application. Instead of targeting the skin’s pigmentation, this type of cream targets the skin itself, gradually peeling back layers over time. As the skin goes, so does the tattoo. Before trying any tattoo removal creams, it’s important to research what is being reviewed as the best tattoo removal creams out there, what kind of chemicals they contain, and what kind of results people report after having used them. Tattoo removal creams will not necessarily get rid of your tattoos, but they will help them fade over time, making them less conspicuous and visible. The effectiveness of tattoo removal creams may depend on the tattoo itself. Some people report that the creams helped fade the colors of their tattoo, but they were left with a clear outline of the tattoo. Depending on the size and location of the tattoo, tattoo removal creams may not be the best option, especially if the tattoo is in a particularly sensitive area. Tattoo removal creams do contain some fairly abrasive chemicals, so it’s important to do a bit of research before applying any. The best tattoo removal creams do offer people another option to expensive and painful treatments, like laser tattoo removal. However, like any tattoo removal method (including laser), there may be side effects, such as rashes or burning. If reducing the visibility of a tattoo is the aim, though, instead of outright removing it, tattoo removal creams can be a very effective and affordable method.